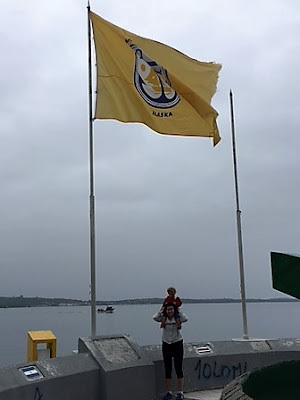 At the southern tip of one of the most southern towns of South America, there is an Alaskan flag. 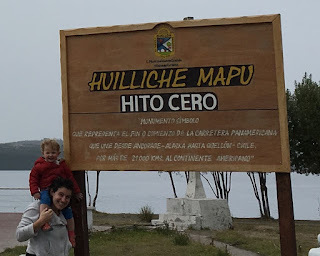 After driving 3 hours south from the city of Osorno, Chile and ferrying our car across the Pacific Ocean, we drove 4 hours further south on the island of Chiloe to the “urban zone” of Quellon, where we came upon a sign indicating we had literally reached the end of the road. Here 19,000 miles south of Anchorage, Alaska, the majestic Pan-American Highway comes to an end. The Pan American Highway is a network of roads that connect all of the countries of North, Central, and South America. Except for the 60 mile Darien Gap, an impassible stretch of marshland that separates Panama from Colombia, an adventurous traveler could conceivably take the Pan-American Highway all the way from the furthest reaches of North America to the furthest reaches of South America -- the beautiful point where our own road abruptly ended a few days ago. (Or to Ushuaia, Argentina, another contended end point of the highway). Other than an Alaskan Flag and a sign indicating the terminus of this great roadway, there was little to indicate the significance of this beautiful, remote spot on earth. In fact, other than two mangy dogs in the act of creating a third, we were the only signs of life here at the end of the road. So we snapped our pictures, took in deep breaths of the cool, salty Pacific air, and enjoyed a uniquely quiet tourist experience. Then we loaded back into our rental VW Gol, but this time with me in the driver seat. Sydney tightly belted into her seat and Nolan gripping the sides of his chair, we began my first lesson in driving a stick-shift. Rather than being scared, Sydney seemed exhilarated by all of mommy's lurching and stalling. Daddy was a little less enthused. But within just ten minutes, I started to get the hang of it, and I drove down the first kilometer of the Pan American Highway before Nolan's concern for Sydney's safety superseded his interest in teaching me to drive. Slowly jerking my way down this highway, I took a last glimpse of the flapping fraying Alaskan flag in our car’s rear view mirror and I could not help but wonder what flag decorates the north end of this amazing highway. Does Alaska celebrate its southern cousin, as Chile celebrates it? Although not a part of our current journey, perhaps we will one day travel to the end of the road in Alaska. When we arrive, we will look for a Chilean flag.